Backyard Night Sky over New Jersey. 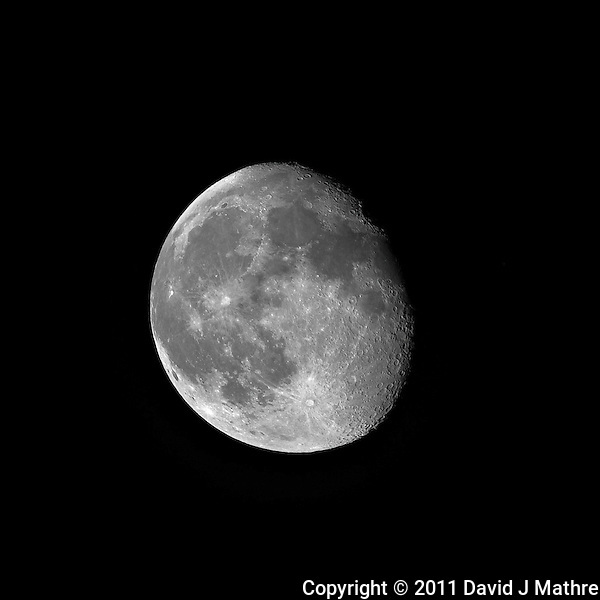 I think that this image of the waining gibbous moon with the D3x and 500 mm telephoto lens is sharper that the one I took with the D3x and 600 mm lens of the full moon 15-June-2001. Both were on a Gitzo tripod and Wimberley head, remote shutter, mirror up with 30 sec delay. Waining Gibbous Moon over New Jersey. Image taken with a Nikon D3x and 500 mm f/4 VR telephoto lens (ISO 100, 500 mm, f/4, 1/160 sec). Raw image processed with Capture One Pro 6, Focus Magic, and Photoshop CS5.